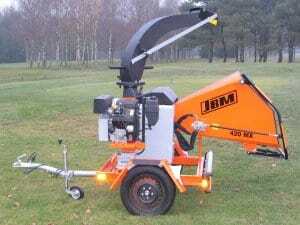 JBM wood chippers for municipalities, landscapers, and arborists. From entry-level model to high-performance wood chipper for extremely large volumes. Trunk diameters between 210 and 280 mm. 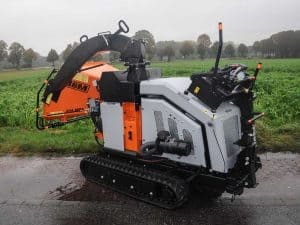 JBM wood chippers: What do they have? You will enjoy a JBM wood chipper for a long time. It is built from robust and proven components, making a JBM very reliable. For powerful chipping for many years to come. How much power does your JBM need? Everybody talks about wood chippers. And everybody has a different name for them: wood shredder, wood chipper, wood cutter, chipper shredder, brush chippers. But, they all have the same goal: to chip wood. 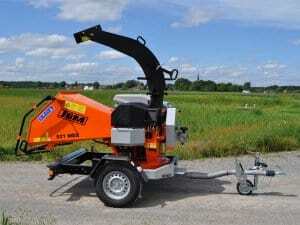 Engines from B&S: And your wood chipper benefits from high power density with a compact engine block design. Centrifugal Multi-Stage Air Cleaner: for safe operation under extreme conditions. Improved protection against contaminated air in engine compartment. Cast-iron Sleeve: for long engine life and low oil consumption. Magnetron® Electronic Ignition System: ensures maintenance-free, easy starting. OHV Technology: optimized performance that delivers longer engine life and improved fuel economy. Heavy-duty forged crankshaft and cast-iron camshaft: for longer engine life even under demanding use. Optional dual element air filter: for additional protection against air contaminations. Full pressure lubrication with oil filter: continuous oil delivery under pressure to critical engine components in the crankcase. For maximum lubrication and long engine life. 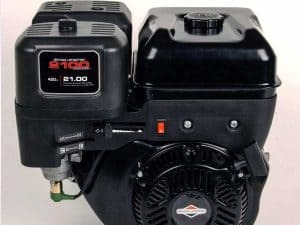 Engines from Kubota: Compact engine block design with high power density. 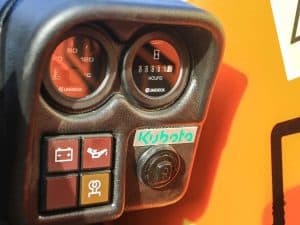 Low exhaust emission: Kubota has always paid special attention to the improvement of fuel consumption and exhaust emission values of their engines. All Kubota diesel engines are already EPA TIER II certified. 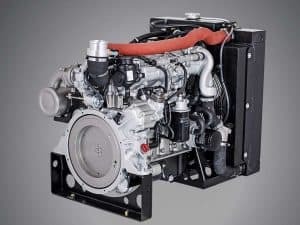 Low noise emission: Kubota's experience in the construction of noise-reduced diesel engines and the E-TVCS (Three Vortex Combustion System) warrant a low noise emission level while operating under load as well in idle. With some engines series a floating mounted valve cover and molybdenum coated pistons provide for especially quiet and smooth-running engines (Super-Mini-Series / Super 03-M-Series / V3-Series). 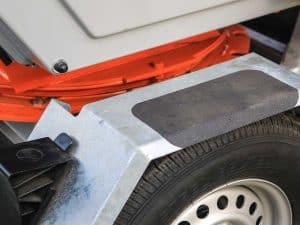 Quick start-up: The Super-pre-heat-system that belongs as standard equipment significantly shortens the pre-heat span and ensures that the engine starts up without problems even at low outside temperatures. 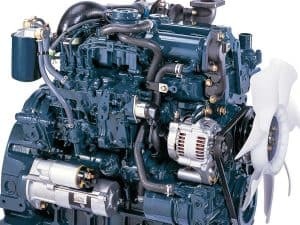 High reliability: The robust construction that is typical for Kubota engines without employment of electronics, belts or similar expensive components that are prone to failure ensures high reliability and durability and a long engine life. Diverse equipment and extensive accessories: for example, for automatic cut-off in the case of overheating. It protects the engine from serious damage even under most extreme environmental conditions. The Hydraulic pump features a direct design. 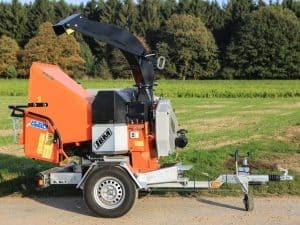 Service and maintenance: All areas and assemblies relevant for maintenance can be inspected immediately and are well accessible in JBM wood chippers. The air cooler is additionally protected using a fine particulate filter, which can be easily cleaned. Common-Rail Technology, turbocharger and external exhaust gas recirculation ensure the reduction in size and weight while maintaining high engine power and good emission values. The result is a turbocharged 2-liter engine with a maximum power of 74 hp (55 kW) and a weight of 173 kg - the benchmark in its class. The engine fulfills the strict limit values of EU 97/68 Stage III B in the EU and EPA Tier 4 final in the US without a particulate filter. This protects your engine reliably from damage. 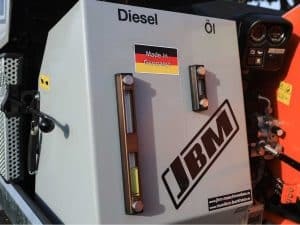 JBM installs engines made by B&S and Kubota with the latest exhaust technology according to the currently applicable standards. Large pulleys with power belt allow the transfer of higher powers while keeping the shaft load of drive motors and chipper disks low. Your JBM gains in durability. The industrial freewheel clutch ensures a robust drive application while transferring highest torques. The design of the industrial freewheel clutch allows automatic switching on or off. 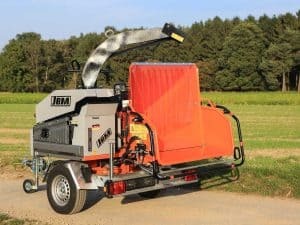 Thanks to the clutch, the wood chipper after-runs after switching off without vibrations, which are reduced to a minimum. And: The clutch is virtually maintenance-free. Our quality axles of renowned German manufacturers impress with their robust and durable design. 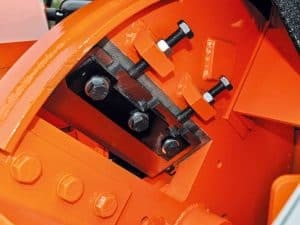 Thanks to the additional installation of damper systems, you can run this axle at a maximum operating speed of 100 km/h. Our quality axles of renowned German manufacturers impress with their robust and durable design. 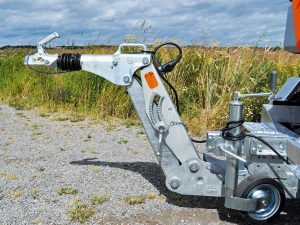 A towing device for experts: Protected, internal transfer device with simple and effective automatic brake. 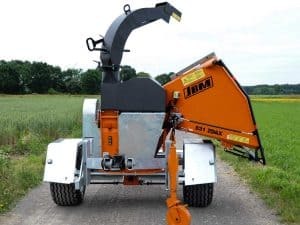 Our 750-kg wood chippers can also be operated using an unbraked tow hitch. The towing device for experts: Universal connection to passenger cars, off-road vehicles and trucks. 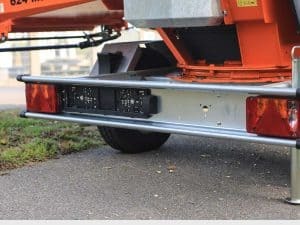 Depending on the tow hitch on your towing vehicles, you can choose between a DIN tow eye or a tow ball. Benefit from a stable, durable and valuable frame. The frame construction of JBM wood chippers is made of quality steel with integrated reinforcements and hot-dip galvanizing. Stable, accessible fenders with hot-dip galvanizing. Perform maintenance and adjustment work without additional climbing aids. Every wood chipper is equipped with additional wheel chocks. A lighting system for long-term, fault-free operation. With protected, recessed lamps in sturdy frame construction. The lighting system is mounted to the frame construction using rubber dampers. 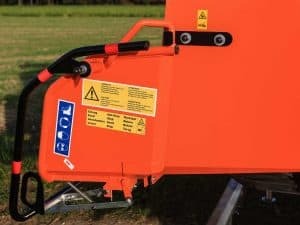 Vibration transfer from the wood chipper to the lighting system is reduced to a minimum. 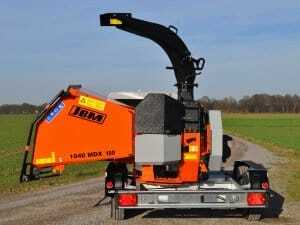 A variety of JBM motorized wood chippers in trailer version can be retrofitted to a driving speed of 100 km/h. 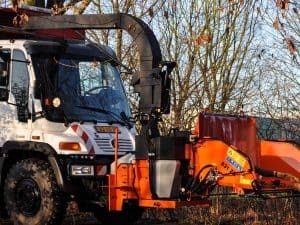 We also offer TÜV approval including certificate for your wood chipper so that you can immediately use it on public roads. 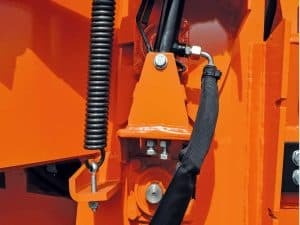 Our wood chippers on axles are equipped with wheel chocks by default. This way, you can always park them safely. 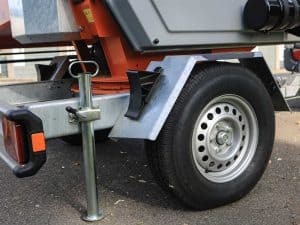 Allows safe wood chipping when not connected to towing vehicle. This saves space and makes the machine even more compact: All JBM wood chippers are optionally available with a large, hinged feed hopper. 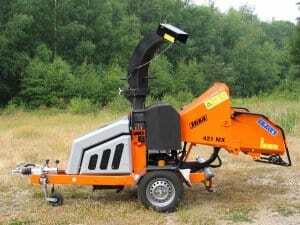 JBM wood chippers of the 800 and 1000 series are optionally available with hopper cut-out. You will be all ready to go for crane loading. 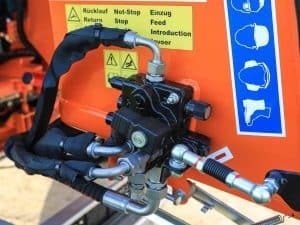 All directional functions of the feed rollers can be controlled directly via the operator handle: Feed, stop, and reverse can be adjusted easily from any operator position. Without additional operating elements, such as buttons. 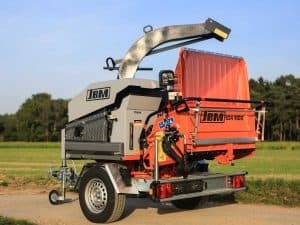 Many JBM wood chippers are available with a 300° rotatable chipper unit, enabling convenient turning of the feed hopper towards the operator. The result is significantly simpler feeding and more efficiency during wood chipping. JBM wood chippers are voracious. Whether knotty material, large amounts of shrubs, thick trunk diameters, fir branches or even wet material: A JBM draws in everything. Evenly and safely. The encapsulated feed system avoids material discharge from the feed area. This avoids contamination of the wood chipper interior or of the street. Chipping – without problems would be the best! The roller wrapping protection prevents shrubs from wrapping around the feed rollers. For continuously aggressive, fault-free feeding. Easier feeding: JBM wood chippers of the 800 and 1000 series are available with conveyor belt in the feed hopper. The feed speed of the rollers is synchronized with the conveyor belt speed. Some chippers can also be equipped with gripping feed rollers. Feel free to contact us. 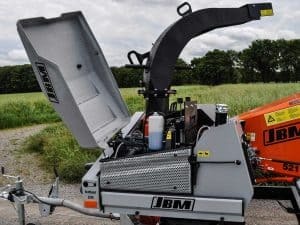 JBM wood chippers are equipped with a hydraulic, continuously adjustable cutting length adjustment by default. They produce wood chips of 0 - 25 mm. and can ideally use the available chipping capacity. Thanks to the continuously adjustable material feed speed, the required cutting capacity can be adjusted to the material to be processed. This creates even more flexibility. 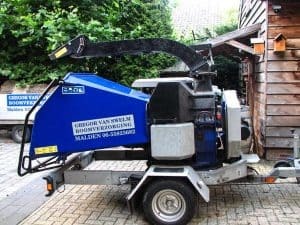 All wood chippers offer an optimum loading height. You can feed the materials to the feed rollers without problems. Upon request, we can customize the loading height to your specifications. The cutting area is one of the core components of every wood chipper. 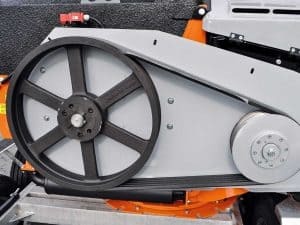 JBM machines offer a stable blade mounting system and a massive, generously dimensioned chipper disk with reinforced blade insert. JBM attaches particular importance to a generous dimensioning of the chipper disk in all model series. 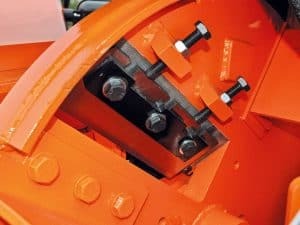 The large chipper disk diameters allow a large discharge range of the chipped material. The higher disk thickness ensures high inertia and high stability of the chipper disk at the same time. This way, temporary load peaks can be compensated in the case of limited engine power. Thanks to additional reinforcements in the blade area, breaking of the chipper disk can be prevented even under extreme loads. To ensure smooth, low-vibration operation of JBM machines in all speed ranges, JBM chipper disks are dynamically balanced. Particularly generously dimensioned discharge for fault-free working. 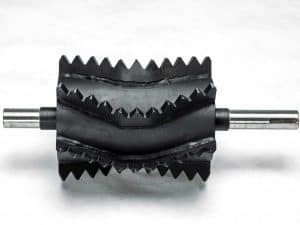 In connection with an optimum chipper disk speed, a large chipper disk, and generously dimensions discharge blades, you benefit from a large discharge range of the chipped material. Blades can be sharpened several times resulting in wood chipping with minimum blade costs. Reusable counter blades reduce blade costs. The side walls are subjected to particular wear due to the cutting process in their proximity. The side wall wear protection significantly contributes to value retention of a JBM machine. Stable mounting system generously dimensioned. To ensure that unexpected additional loads do not leave permanent impairments. Additional wrapping protection acting as sealing system at the same time. The wrapping protection protects the rear main bearing from foreign objects penetrating, such as plastic ropes. Using the swivelable discharge chute, you can place the wood chips at any location. For simpler material disposal and additional occupational safety. The adjustable spread cover controls the discharge range and accurate placement. Additional securing of the discharge chute for safe wood chipper transport on public roads. 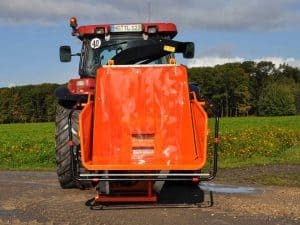 Silent discharge chute with integrated noise protection: another contribution to reduced noise emission of our wood chippers. We are looking forward to realizing your requests for special applications, such as loading of cargo areas of towing vehicles or containers. We can implement custom adjustments in horizontal as well as vertical discharge direction. 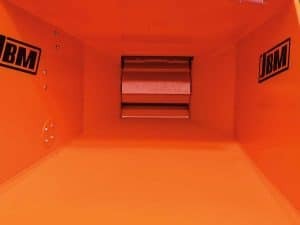 The machine height can be significantly reduced with the hinged discharge chute. Ideal for transporting your JBM through entrances with low clearance. 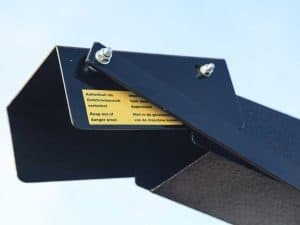 Our height-adjustable discharge chute provides even more flexibility when placing the wood chips. This can help with different towing vehicle with cargo areas. 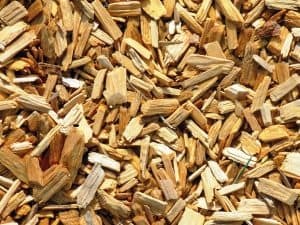 Wood chips are calibrated for heating systems using a specially developed screening system. This way, you can operate your JBM wood chipper easily, safely and ergonomically. The feed rollers are reliably and durably controlled as well. Upon request, we configure our machines also with an electrical button control. 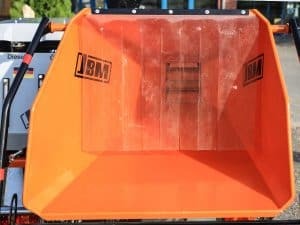 JBM wood chippers offer maximum personal protection during operation as well as maintenance. Our machines are designed according to the high requirements of the GS standards and relevant regulations of the employers' liability insurance associations. 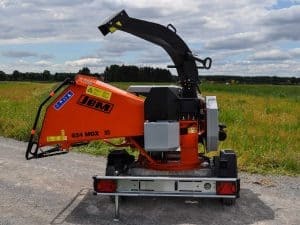 Many JBM wood chippers are available with a 300° rotatable chipper unit. The result is significantly simpler feeding and more efficiency during wood chipping. Engine control with integrated service block for operation and control of all engine functions. Including engine protection functions, such as automatic engine cut-off in the case of overheating. 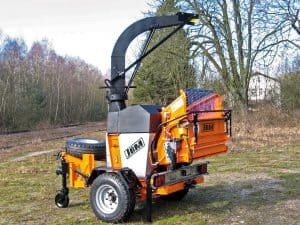 A JBM wood chipper can be further operated even if the anti-locking system control fails. Thus, we separated the anti-locking system chipper control for automatic roller control purposefully from the engine control. The sensor-controlled engine cut-off switches off the engine in the case of an emergency to prevent damage. 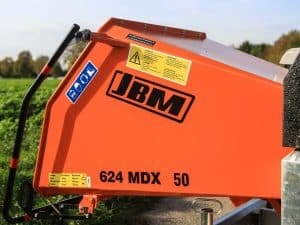 JBM wood chippers are equipped with a hydraulically adjustable cutting length adjustment by default. Adjust the length of the material to be chipped continuously. The anti-locking system continuously monitors the cutter disk speed. 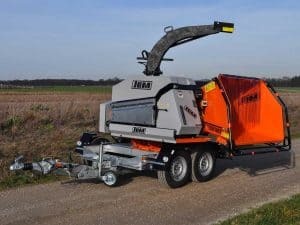 If overloading of the wood chipper is imminent, the material feed is stopped automatically by the feed rollers and restarted. This enables an automatically controlled material feed. The machine cannot be overloaded or clogged. The work sequence is optimized and the operator relieved. 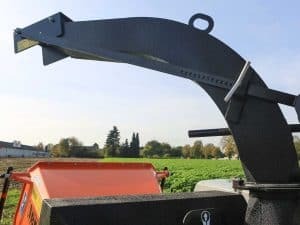 Using this function, the wood chipper can be easily fed with short, large-diameter pieces of wood. For this purpose, the opening area of the feed rollers is increased to more than 100 mm. This is another contribution to ergonomic loading while increasing occupational safety. 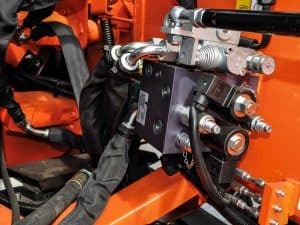 The compact control block combines the standard hydraulic actuation of the feed direction with continuous feed speed control with the hydraulic roller opening and integrated anti-locking system. 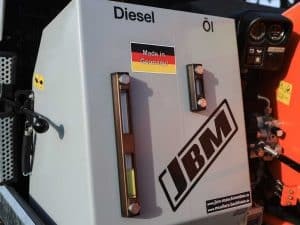 JBM wood chippers are equipped with filling level indicators for hydraulic oil and fuel. Thus, you can always check the quality and quantity of the operating fluids. 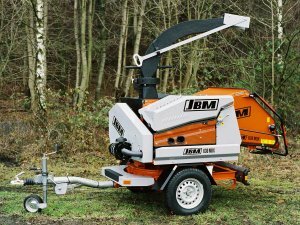 JBM wood chippers offer maximum personal protection during operation as well as maintenance. For this purpose, our machines are designed according to the high requirements of the GS standards and relevant regulations of the employers' liability insurance associations. 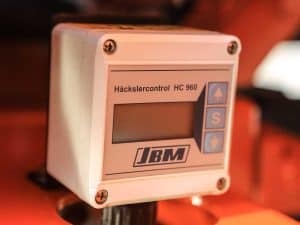 Enjoy additional safety: All pressurized hydraulic hoses of a JBM are additionally wrapped in a strong burst protection fabric. Hydraulic fluid suddenly escaping due to bursting hoses represents an extremely high risk to human health. We here at JBM understand our responsibility as manufacturer. We are more than happy to offer this protection, which should be standard everywhere. 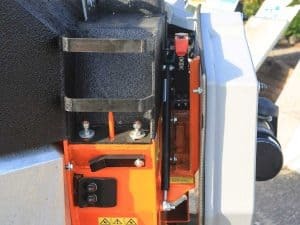 What happens, when stones or metal parts are fed to a wood chipper by mistake? And at the typically high speeds? Tremendous load would be applied to materials installed in the turning circle of the chipper disk. The cutting system might be damaged or even destroyed. In the worst case, material could exit uncontrollably from the chipper disk housing. 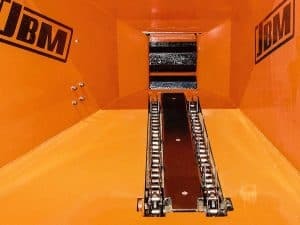 To ensure that such a danger potential does not exist in the JBM, we do not only comply with the legally prescribed material thickness, our upper and lower chipper disk tunnels are designed with double walls. Compliance with the safety clearances and installation of the safety operator handle according to the current safety standards enables easy and safe operation. 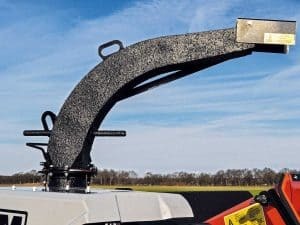 The circumferential safety bar is the most effective protection against the operator being caught unintentionally by the feed rollers: If reaching into the hopper area too far, the operator moves the operating handle with his legs or arms into the stop or reverse position. All functions, such as feed, stop, and reverse, can be easily operated from any operator position. The massive upper tunnel can be easily opened with the help of a gas pressure spring. 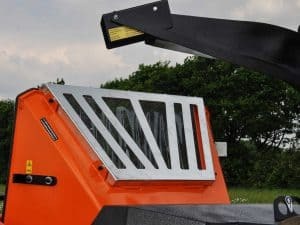 This allows quick, easy, and safe access to the cutting system. 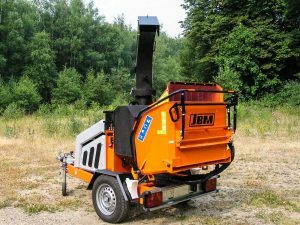 JBM wood chippers feature low-noise designs. Respective structure-borne sound emissions are reduced through additional coating systems specifically developed for our application case. A pleasing contribution to noise reduction. 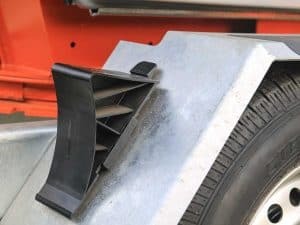 The integrated hard rubber strip in the silent discharge chute significantly reduces the sound emissions occurring in the area of the discharge chute. Another contribution to noise reduction during wood chipping. Against uncontrolled ejection of fed material from the hopper. Special blade steels in conjunction with a special hardening process ensure high service life. Blade breakage is avoided at the same time. Adjustments and replacements on the cutting systems are easy and quick thanks to the wide-opening upper tunnel. The wide-opening service hood are mounted interlocking via rubber dampers. They can be opened easily and without tools. All points relevant for maintenance and service are immediately visible and can be easily accessed. The massive upper tunnel can be easily opened thanks to the gas pressure spring. For quick and easy access to the cutting system. 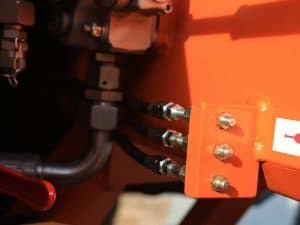 Using the Duo lubrication system, you can grease difficult to access lubrication points quickly and easily. 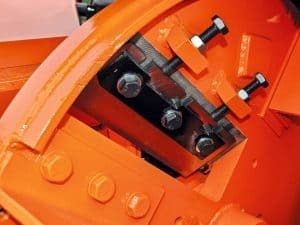 For example, the rear main bearing or the mounting points of the lower rollers. All tank systems are equipped with liquid filling level indicators. This way, you are informed about the remaining fuel or hydraulic oil level at all times.